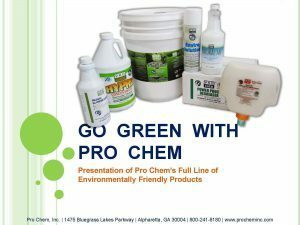 Pro Earth Paint Stripper | Pro Chem, Inc. PRO EARTH PAINT STRIPPER is a cost-effective, low VOC, environmentally sound solvent specifically formulated to strip polyurethanes, paints, and similar finishes. It is a nonflammable, biodegradable, safe replacement for strippers containing methylene chloride. Its soy-based formula is enhanced with man-made cosolvents and natural thickeners, making it ideal for stripping both floors and vertical surfaces. It can be sprayed on, yet has sufficient viscosity to adhere to vertical surfaces. Dilution: Pro Earth Paint Stripper contains no water and is intended to be used undiluted. Apply with brush or sprayer. Test all sprayers, brushes and surfaces to be treated for solvent compatibility. Avoid contact with plastics. Wood and tile floors: Spot test for finish compatibility prior to use. Spray or pour on flooring and allow 15-45 minutes to activate. Monitor activity. Dwell times may be extended up to 12 hours with no adverse effects. Wash or brush away old finish or remove with suitable extraction equipment. Properly dispose of residue. Paint stripping: Test items to be stripped for compatibility. Spray or brush on a thin layer and monitor activity, watching for paint to bubble. Rinse, scrape, or wipe away residue. Graffiti Removal: Spot test area to be treated first. Apply with a sprayer or brush. Monitor activity to prevent removal of undercoat. Wipe off or remove with water. Brushing may be necessary on textured or porous surfaces. Always use solvent-safe eye shields, boots, and gloves and avoid skin contact. See SDS.